For those of you awaiting news on the fourth generation Motorola Moto X, we have something interesting to tell you. This year, we should see the device given the moniker of the Motorola Moto X4. But that isn't what we really wanted to tell you. Actually, we want you to think back to December when the sun set much earlier, the temperature was colder, and no one was parading around Apple like Chicken Little screaming that "the sky is falling." In fact it was the middle of December when a leaked image of the fourth generation Moto X graced our site. At the time, the device was still being tested and we told you that the final design could look quite different. Speaking of looking different, the big round camera on the back is one of those things you either love or hate. If you're thinking about giving the Motorola Moto X4 a whirl, hopefully you like the way the rear camera looks because this is what the back of the Motorola Moto X4 could really look like, according to a tweet sent Friday by tipster Evan Blass. The tweet contained a copy of the picture that was originally disseminated five months ago with Blass adding, "Who woulda thunk it? Turns out this is 100% real." Motorola is expected to unveil the Motorola Moto G4 and the Motorola Moto G4 Plus on May 17th in New Delhi and in Mexico. Perhaps we will hear some information at the event that will give us some idea of what we can expect specs-wise from the next-generation Moto X handset. Hopefully this is just a "legitimate photo" of an early prototype. It looks like a blank of stainless steel. I would love a non painted finish like that - just smudgy steel and glass. Hate the same looking protruding camera as 6/6s. I like the look of stainless steel too, it's just this picture looks like an unfinished piece to me. The LED flash just looks offensive. The rest is fine. Speaker in the back + a big camera hump. 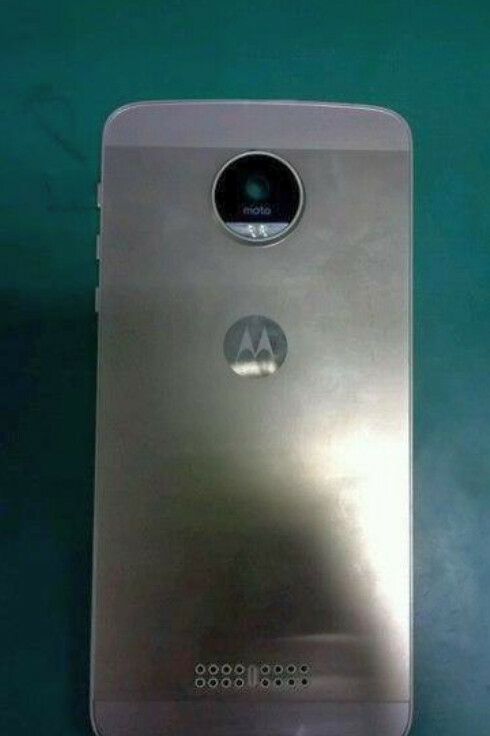 Really poor design Moto! Well I guess the Moto X Pure Edition will be the first and last great Moto X phone. Sadly you are correct. Well I liked the first two Motos too. I think the original Moto X was the best ever Moto X.
I loved the latest one, I just wish it was closer to the original Moto X in size. Seriously though, what's wrong with the design? I definitely like the big round camera and all metallic body, could be uni-body... It's not like you're going to 'enlist' your smartphone in a "Smartphone Beauty Contest"... If you'd prefer a plastic phone, then do forgive me for saying this. but: YOU'VE CHEAP TASTE... But then again, not everyone like scotch, eh? G'Day! You're very spot on! I'm actually liking the look of the phone. The pure naked metallic finish!!!! I even like the huge camera bulge (sue me). The final product is gonna rock and we're all gonna come around like we did with the Nexus 6p and pretty much most other phones. Dear PA have you considered making an app!? mobile site is GARBAGE. almost unusable. 430 is a watered down 615? its the GPU we're concerned with. 1080p display remember. I'll take one of the current budeget options for blu, asus or honor. PA lease do budget phone camera shootouts like you do with flagships (sub $250). Budget phones are getting better. If they cant make a good mobile site, what makes you think the app will be any diff? Looks like crap. There I thought there wouldn't be any ugly phone this year like G5. If they really release this then it will also see the G5 effect meaning low sells. I actually like the look of the thing more or less. Hoping for a black faceplate though. Thought it was just me, but this product really seems like it's gonna be a hell of a badass phone. The final product will be wicked on a black plate and yes I like the camera bulge too. Will have a hard time deciding between this and the HTC 10. Specially the back speakers. I was looking to buy btwn moto x4 or one plus 3 .lf this is the next moto x then I will surely go for the OP3. Pretty sure the iPhone 7 will look better than every phone out there bar the S7E. This 100% real. I mean we've through this over and over and over again where a leak comes out and we laigh, doubt and mock at it at first and as the day goes by it starts becoming clear that it's real and then BAM, the final product comes out and then surprise surprise. Would bet anything that this is actually the final product maybe add in a little modification here and there but this is it.